I'm itching for some gaming. Any gaming. I was browsing through the Google Play store & looking at phone games. But I'd rather push some figures around. I think that it's finally time I start trying to put together my first solo game in the Marienburg vs. The Undeadish campaign. I have started cutting, pasting, and tweaking his army lists into two modified lists for my own factions. I'm considering these as just a starting point. 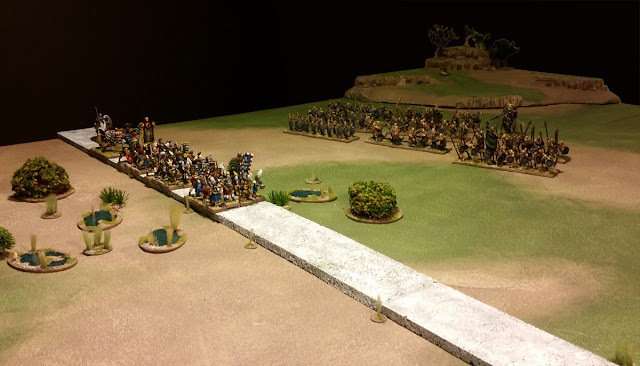 The Marienburg list is big, and represents a lot of both painted and possible units that may appear at some time. The Undeadish list is smaller and simpler, but could see more additions. I imagine that I will change things up quite a bit after both lists see some action. I still need to add the commanders. Since this is my first solo game, first game of Shadow Storm, and first game in years of Hail Caesar (and one of only a few I've ever played) I'm going to keep things simple. Maybe an undeadish "breakthrough" scenario. I can deploy the Marienburgers at the edge of a village. Undeadish will then be deployed randomly. Their goals will be to head off the other side along any of several exit zones, killing everything that tries to stop them. The Marienbugers will, obviously, be trying to stop them from entering the village. That's about it. This will give me my first chance at playing solo, as well as getting reacquainted with the Hail Caesar rules. I can add on programmed actions for the Undeadish, event cards, and some of my other planned experiments later. How are you going to do the solo mechanics? Are you going to play both sides,or do you have some sort of "driver" for the opponent? I have done the former,and so long as you can maintain a detachment from either side,it makes for a fun game. I've got some more complicated "programming" ideas for later on, but to start with I'm going to try keeping things simple. For now I will fully play the Marienburg army of the living, and the undead army will be on semi-autopilot. To help balance out the predictable nature of the undead, I will give them a numeric superiority. In fact, I may just make it a lost-cause and the Marienburg objective will be just to see how long they can last. Or a caravan attack, where they will have to exit as many wagons as possible off a designated area of the table edge before being overwhelmed, etc. After I've tried out some basic solo games, I may try adding in "leadership traits" for the undead commanders, so that each will act somewhat differently. I'm thinking of this in terms of very simple flow-charts for their actions. I may eventually try a few different ideas for decks of cards, such as random activations, random events, etc. in order to liven things up. Sounds good! Another idea that you can try is to draw up several reasonable battleplans for the programmed army to follow as closely as possible,and write standing orders for them based on their plan and character-"If this happens,then they will do this".Naturally the command rolls will work great for this,because they might not be able to pull off what their supposed to do.Solo gaming really is a thinking man's game!